May Announcements and June Meeting! Our June meeting will be on Wednesday, June 26th starting at 7:00pm. It will be held at UAT (University of Advancing Technology) this month. Our speaker for this month will be Tristan Moore. 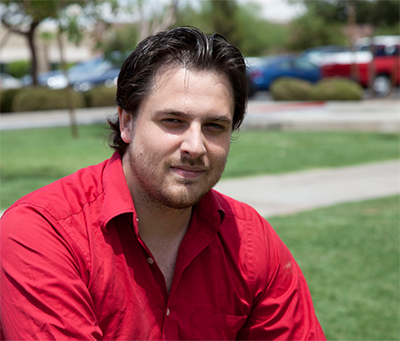 Based out of Tempe, Arizona, Tristan Parrish Moore has worked in the entertainment, gaming and simulation industries for several years. In addition to the production of a number of small-scale independent games, Tristan has worked in film crew, acting, theatrical set production, military simulations, game quality assurance, 3D art and level design. Tristan currently works as a Senior Game Designer at Redacted Studios, with developers who have worked on a variety of titles including God of War, Afro Samurai and Legacy of Kain: Blood Omen 2. Join us for our feature presentation: Reading the Gaming Pulse: Forecasting for an Infant Industry. A presentation fused with open discussion which will tackle a broad range of influences and issues which affect gaming. This objective look will include where gaming currently stands and where we might draw points of reference from other industries to make predictions. In addition to the content and ideas presented, this is meant to be an open dialogue among developers about our goals for a still burgeoning medium. A reminder that the Game CoLab (http://gamecolab.org) is open for business. They’re located in the Levine Machine on 7th and Grant near Chase Field. It’s an awesome space and it’s filling up with all sorts of cool people! Be sure to reserve your place in the CoLab soon. You can email Ben Reichert (ben@gamecolab.org) or Joseph Darnell (joseph@gamecolab.org) for more details. Future is Games (http://futureisgames.com/) is a conference happening here in Phoenix, from October 9th-11th. To get more details, you can sign up for the mailing list on their website. They’re still looking for speakers, so be sure to hit up Tyler Coleman (tylerthedesigner@gmail.com) or Zachary Snader (zachary.snader@gmail.com) if you’re interested. A reminder that the Lisa Frank company in Tucson is looking for an HTML 5 game developer in the Phoenix area to make a game for the Lisa Frank website. This would be a contract position for a match-3 style game. If you’re interested, contact Kathleen Bober (KBober@lisafrank.com) for details. Itching for a game jam to start off the summer? UAT’s got you covered! This jam will take place on the weekend of May 31st – June 2nd at University of Advancing Technology. As always, you can check out their Facebook page (http://facebook.com/UATGameJam) for more details. As always, the game jam is open to everybody, regardless of age or skill level! Still a little fuzzy on the details? Here’s a quick overview of how our local game jams work: https://igdaphoenix.wordpress.com/game-jam-faqs. Hope to see you there! PJ and the crew at Super Fun Games (http://superfunproductions.com/) are looking for a part-time Unity programmer to add to their Crystal Catacombs project (Pixel-art procedually-generated Medroidvania). If you’re interested, email your resume and Unity experience to superfungames@superfunproductions.com. Just a reminder that local developer and publisher Gamez& (http://gamezand.com/) has openings for a Graphic Designer/Artist and Programmer. If you’re interested, please email info@gamezand.com. Rotato is the latest game on iOS from Chris Zukowski! It’s in beta, and he’s currently looking for testers. If you’re interested, please sign up on his testflight, located at: http://tinyurl.com/rotato. Local developer and programmer Conrad Rustad has launched a Kickstarter for his card game: Drive Them Back (http://www.kickstarter.com/projects/wedontknowgames/drive-them-back). If you’re a regular at the Game CoLab’s game nights, you already know how much fun it is! The success of the Kickstarter will result in the game’s first print run, so if you’re interested, spread the word or contribute! Interested in filling in on teaching Game Design & Programming at ASU’s West campus? Email Theresa Devine (tcdevine@asu.edu) for details. The ASU Summer Camps are coming up quick! Led by Yoshi Kobayashi, these camps are for high school or middle school kids who have an interest in making games. For more information, check out: http://gaming.asu.edu/. Don’t forget, the IndieCade deadlines are coming up fast! Regular submissions are open until May 31st, and late submissions are open until June 30th with an additional fee. Check out the submissions page on their site for more details: http://www.indiecade.com/submissions/. Retora has an opening for a Server Developer. This is a temporary position with possibility of full-time. If you’re interested or know someone who is, contact Tyler at tylerthedesigner@gmail.com. A number of developers, games and dev-related ventures have been featured in articles in Examiner (http://www.examiner.com/), thanks to local writer Jesse Tannous! He’s always looking for new material, so if you have something newsworthy give him a ping (jesse_tannous@yahoo.com).